The firm’s office is located on Mercury Row, just off Kirkgate, which is the main road through Otley. Christmas Holidays 2018 – The Office will be closed from Monday 24th December 2018 and reopen on Wednesday 2nd January 2019.The Partners and all the team would like to wish all our clients and associates a very happy holiday. Some street parking is available in the locality, and there are car parks within easy walking distance as can be seen from the location plan. 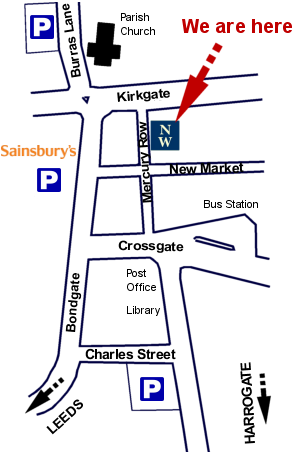 In addition, there is currently up to 4 hours free parking available in the nearby Sainsbury’s supermarket car park, just across the road on Bondgate and a free car park on Charles Street next to Otley library. Visits to clients at their place of work, home or in hospital can easily be arranged, as can appointments outside normal office hours. Please speak to the solicitor in charge or your case. Wheelchair ramp access is available by prior arrangement. Passenger lift to all floors available.